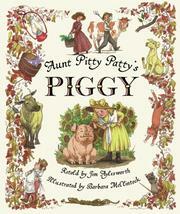 Aunt Pitty Patty and her niece Nelly bring a pig home from the market. But the pig won't enter the gate to Aunt Pitty Patty's yard. Nelly seeks out the help of others to get the pig through the gate but no one is willing. Nelly problem solves to get others to help and they get the pig through the gate before dinner. Aylesworth, Jim, “Aunt pitty's patty's piggy,” Children's Picture Book Database at Miami University, accessed April 20, 2019, https://dlp.lib.miamioh.edu/picturebook/items/show/10146.